It's XCOM. On iOS. Isn't That All You Need To Know? I've spent the past few days zapping aliens and maneuvering troops in the iPad version of XCOM: Enemy Unknown, and I'm happy to report that it's XCOM: Enemy Unknown on iPad, which is really all that you need to know. Also, it costs $20, which is alarming until you realize that you're getting a $20 version of portable, touchscreen-optimized version of a game that came out in October for $60. So, yes. Kotaku's Game of the Year 2012 is out for iOS today, and it's excellent. The touchscreen controls work quite well—you can pinch to zoom, slide your finger to move the camera around, and tap/double-tap to move and assign commands. Everything runs perfectly smoothly on my iPad 3 with two exceptions: the lipsyncing is way off and the framerate sometimes stutters. That said, I believe both of those were technical problems on the console versions of XCOM as well. 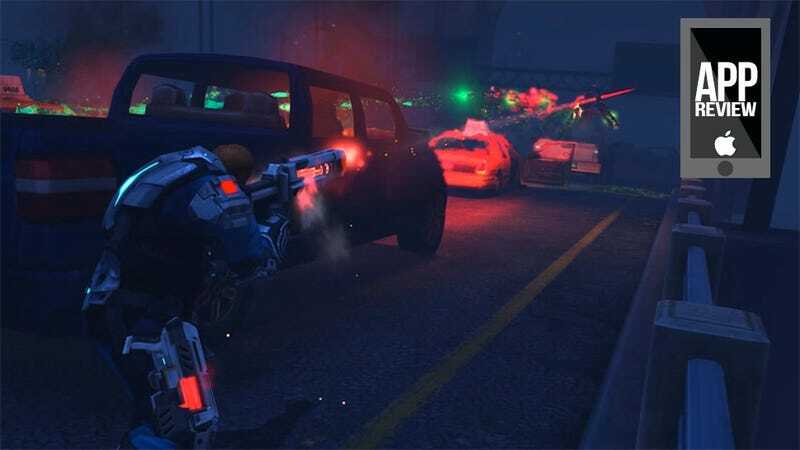 If you haven't played XCOM before, go read Luke's excellent review. In short, it's a wonderful sci-fi strategy game that tasks you with managing a base, balancing troops, and saving the world from aliens. You'll spend the bulk of your time in turn-based combat on a series of battlefields across earth, moving soldiers around wreckage and trying really, really hard not to let them get murdered by aliens. Worth noting: this is a 3.2gb download, so prepare your time/space accordingly. Also worth noting: this game is fantastic and well worth that time/space.